Fun action galore and a creative setting. ...Predator vs. Sol Bianca, set in ancient China's take on Star Wars. Not so long ago but far far away, a young bounty hunter, Iria, is well on her way to a full license, and never misses an opportunity to tag along with her older brother, Gren. Iria, Bob, and Gren can tell that something is wrong with the "rescue" mission they've been hired for when the government sends the military after them before they've even left. Things get much worse when they get to the ship in distress, only to find that its "cargo" is a bizarre superpowerful being known as Zeiram. Things go from bad do worse, and before long Zeiram is singlehandedly preparing for an all-out war. Iria is determined to deal with the problem herself, with Bob, the unwilling hunter Fujikuro, and a scamp named Kei tagging along. But both the Tedan Tippedai corporation and the planetary government have plans of their own for dealing with this little problem. 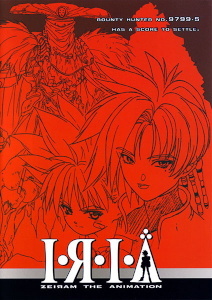 Iria: Zeiram the Animation is a snazzy, creative little action series. It's technically a prequel to the live-action sci-fi/action/horror movie Zeiram, but don't worry if you've never heard of that--you're not missing much. Set in a world halfway between Star Wars and ancient China, the setting is as much of a draw as the characters or action, neither of which are lacking. Put together, the package makes for a thoroughly enjoyable ride. The series may not have a whole lot of plot, but characters are likable and well acted (in Japanese, anyway--gotta love Fujikuro). As for the bad guys, Zeiram is derivative of just about every anime supermonster you've ever seen, but it's still pretty darned cool, and has some impressively weird stuff going on on the side. The action certainly isn't lacking--fast and fun, with a variety of creative technology and techniques. 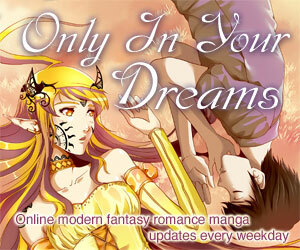 Topped off with attractive character designs and high-quality art and animation, all the fundamentals are lined up. But the world is what sets the series apart--a unique blend of ancient east and futuristic west, picture what would have happened if an ancient Chinese dynasty had developed space travel. There are great stylistic touches everywhere. To cite just a couple examples, the escape pods look like little pagodas, and Fujikuro rides a Dempadan, a sort of flying rickshaw/bicycle. Along with this comes loads of fun technology: Portable shield generators, flying cars galore, lots of big guns, interplanetary teleporters, and the list goes on. But what really sets Iria apart from the rest of the cool gadget club is that the technology always seems practical. A great example is the shield generators; not only do they use these faceted shields to protect spaceships, but they also have portable ones to use as temporary holding chambers in lieu of handcuffs, they use them as a canopy in open-topped spaceship/cars, and (my favorite) in a scene where some smoke sets off the sprinkler system in an office building a bunch of little shields pop up to protect the computers in the room from the water. It's neat touches like that, along with cool little cultural quirks (like Iria's hair beads), that makes the setting seem functional and the series as a whole more substantive than the morass of sci-fi action series. Even the music deserves a nod--ranging from standard action movie fare through near classical style, all the way to the thoroughly different exotic intro theme. Overall, Iria: Zeiram the Animation is loaded with action, has great art and animation, fun and interesting characters, and a detailed world jam-packed with imaginative technology to top it all off. Highly recommended for the fun action, but the detailed world makes it even better. It's called Zeiram: The Animation because it's based on an older live action monster movie, Zeram, made in 1991. The movie takes place quite a while after the animated series (the animation is kind of a prequel), and centers around Iria and Bob's fight against Zeiram, who is busy rampaging around modern-day Earth. 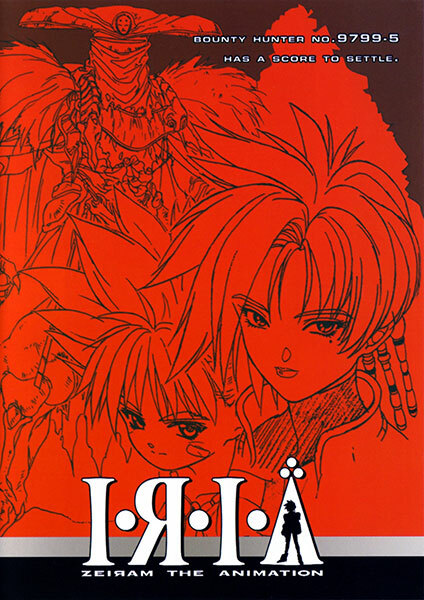 If you're interested, it's considerably cheesier, but Iria and Zeiram look essentially the same, and a few small bits of the creative technology are there--no doubt the inspiration for the animated version. There is also, apparently, a second movie, which I know nothing about. The first, at least, was dubbed and released in America. Incidentally, in addition to Zeiram being renamed Zeram, Iria's name was translated (and not really inaccurately) as Illia in that movie. Another funny note about the names: Some of the names are very Asian-sounding (like Fujikuro), some are made-up (Iria), and some are pretty plain (Bob). But the fun one is Gren--actually, although that is a perfectly legitimate way to transcribe it, it could just as well have been Glen--and looking at Bob, that may well have been the intent. Perhaps the translators just thought that Glen didn't sound cool enough for him. Of course, as was pointed out to me, it's also possible that "Gren" was a reference to "Grendel" of Beowulf fame. Who knows. Currently available in the US from Media Blasters on a 3-disc remastered bilingual DVD set with a number of extras. Was previously available from US Manga Corps on a minimal single-disc bilingual DVD edition (one of USM's earliest DVDs), and before that on 3 subtitled or dubbed VHS volumes. Iria: Zeiram the Animation is Copyright © 1994 Crowd / Bandai Visual / Mitsubishi Corp. / Banpresto / Ashi. Any images are the property of their respective rightsholders, and included for review purposes only under the fair-use clause of US copyright law.